NEW DELHI—In rural India, one man’s trash is another man’s well. That’s the idea behind Clothes for Work, an initiative by the New Delhi-based NGO Goonj. They take old clothes that have been thrown away and mend them. Then they give the mended clothes from the cities to people in rural villages as material compensation to build critical infrastructure. One in five citizens in India—that’s 270 million people—live at or below the international poverty line of US$1.25 a day, according to The World Bank. They live with what they wear on their bodies. While food and clothing are both basic necessities, India’s poor generally prefer the former over the latter for obvious reasons. For many, clothing remains an unfulfilled need their whole lives. When Goonj started to recycle discarded clothes, the NGO wasn’t sure how successful its Clothes for Work concept would be. “Until a few years ago, we didn’t know that it (recycled clothes) has such power that it could dig a well or build a bridge,” said Anshu Gupta, the founder of Goonj. Goonj in Hindi means Echo. As it turns out Goonj fulfills two development goals at the same time: providing clothing to poor communities and mobilizing the poor to build community infrastructure. 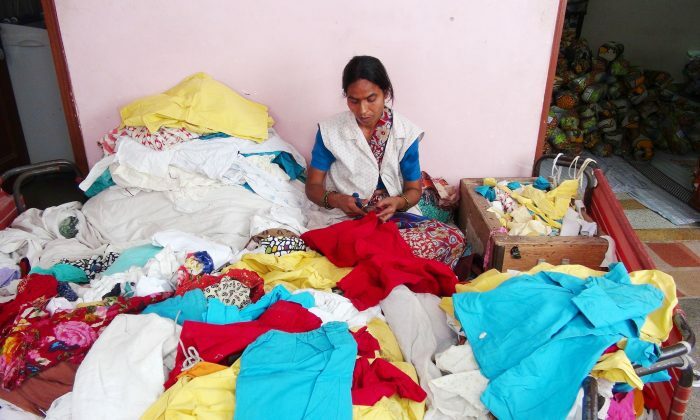 Gupta emphasizes that Clothes for Work also brings dignity to villagers. He said it’s different sleeping in donated clothes versus sleeping in clothes one has earned by the sweat of one’s labor. Once when Gupta and his team were visiting Madhya Pradesh State in central India, people complained to them about the scarcity of water. “We thought, ok, fine, can we dig a well? Only 7 to 8 people (from the village) somehow got excited about it, so we started with 7 to 8 people,” said Gupta. By the end of the month, the entire village had joined the digging, and they struck water within a few days. The entire village was paid in the form of clothing for their labors. This was a turning point for the organization. “This was like a big ‘aha’ kind of a moment and we said, ‘Ok, fine, this material has the power to dig a well, so we can always make a bridge,'” said Gupta. Today, Goonj dispatches 50 tons of recycled clothes across 21 states in India every month. Last year, these clothes were used as compensation for labor on 1,200 infrastructure development works across rural India. The organization receives grants from donor agencies of half a million dollars a year. It uses the cash for logistics like salary to staff and delivering the clothes around India. However, the organization supports rural community development largely through its novel idea of Clothes for Work. In certain rural regions it has also started providing kitchen utensils as compensation for labor. Due to climate, geography, and weak infrastructure, India is hit hard and often by natural disasters. The clothes Goonj recycles are used to provide relief. Clothes for Work also brings in community involvement in post-disaster infrastructure rebuilding. This helps because many times governmental bodies take too long to reach disaster-struck areas. “Every year in the month of July we know that there are pockets, which are going to be flooded because of the geography or whatever the reasons are. That’s where you need to rework. Every year you need to go there and start building because they lose lots of infrastructure,” said Gupta. During his work as a budding journalist in the 1990s, Gupta had once come across a rickshaw puller who lived with his family in New Delhi. The rickshaw puller’s full-time job was to pick up unclaimed dead bodies from the streets in his area. He picked up more dead bodies in winter. “He use to pick up 10 to 12 dead bodies within a 3 to 4 kilometer range of where his rickshaw was able to go, every 24 hours,” said Gupta. According to him, a lack of clothing in winter claims many lives in India. “Someone dies on the road and I survive and enjoy my life. It’s not the cold, it’s the lack of clothing,” said the rickshaw puller. In a narrow street just outside Goonj’s office, a group of male workers are loading white bags of packed and categorized clothes into small tricycle carts. And some of the bags are thrown from the first floor over steep stairs into the dusty street below. From there they are loaded onto a truck at the end of the street. The truck is bound for Odisha, 800 miles away, on the east coast of India. It was pummeled by a deadly storm early this month. The truck carries clothes for the second phase of disaster relief. Indian Prime Minister Modi is looking to his immediate neighborhood to develop trade and India’s economic strength and regional influence.